Letter from Dr. David H. Templeton to LP RE: reports two more facts to LP about the Madelung constants. [Letter from LP to Dr. Templeton March 5, 1953] [Filed under LP Correspondence: Box #410, Folder #18]. Letter from Prof. I. M. Kolthoff to LP RE: writes to LP that on March 15, 1953, he will attend his last meeting ever with the Advisory Committee for Chemistry of the Air Force. Writes that he will explain the matter to LP when they meet. Gives details about his schedule in the hopes of planning a meeting with LP. 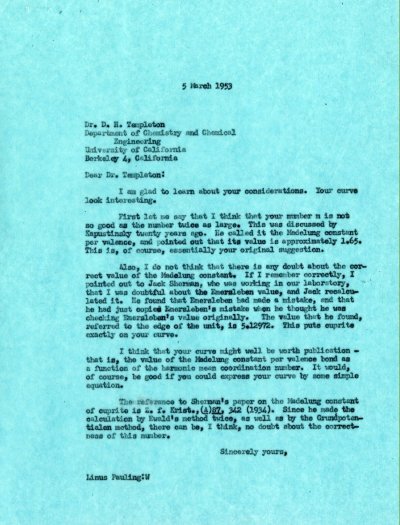 [Letter from LP to Prof. Kolthoff March 3, 1953] [Filed under LP Correspondence: Box #199, Folder #8]. Letter from W.H. Freeman to LP RE: Informs LP that his final manuscript for the second edition of General Chemistry is being forwarded to the printers, and that a publishing schedule will be sent shortly. [Filed under LP Books: Box 1953b, Folder 1953b.1]. Note from Mr. John Pucciarelli to LP RE: Writes that he recently read in the Sunday Times about the chemical tests that LP is conducting on the fight on cancer. Requests word from LP as to whether he thinks the experiments will conquer cancer. [Letter of response from LP to Mr. Pucciarelli March 23, 1953] [Filed under LP Correspondence: Box #313, Folder #1].